When you have a hellish week, there are nights where you’re going to miss out on sleep. We can pay off that lack of proper rest when we die, but that doesn’t mean we don’t need to look bright-eyed and bushy-tailed during the days following the long nights. Since we can’t put more hours in the day, we spend money on serums, lotions, and gadgets that will give off the appearance of a well-rested person without actually having to be one. If you seem to live in a constant state of tired, then this Hush Time Menion Eye Warmer will help soothe your eyes, if only a little. Speaking from experience, you can only go so long before your eyelids start to twitch and feel like they’re being kept open by sheer will alone. While a warm towel will do about the same as this device, this gadget is portable, won’t make your face damp, and you don’t have to run the water for five minutes to get it hot enough. This has three modes of heating, and should be warm enough for use within a few seconds of being turned on. 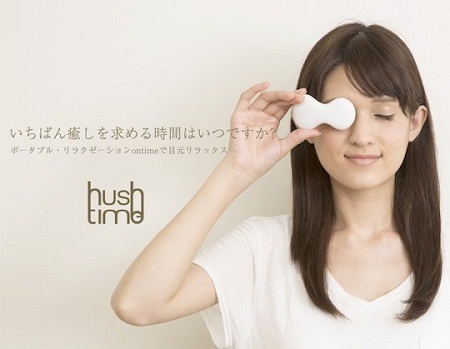 You only need to press it gently over top of your eyelids for a minute or two before some of the edge will disappear. This is not cheap at $255, but is targeted for those who run a hard schedule and have to look like they walked off a magazine everywhere they go.